Boil tomatoes, remove skin and mix it in the mixture or with a blender. Boil macaroni, don’t overcook it. Put it in the sieve to drain water. Pour cold water, it will help to separate macaroni. Finely chop basil leaves. Take a pan. 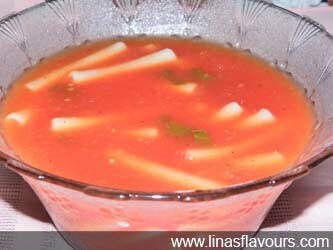 Add tomato soup, boiled macaroni, 2 glass of water, salt, basil leaves, oregano and cook it for about 10-12 minutes on a low flame. You can remove tomato seeds by straining it in the steel sieve after mixing it in the mixture. Personally I like seeds so I don't strain it.